One unique holiday tradition in west central Minnesota is the arrival of Canadian Pacific's "Holiday Train." 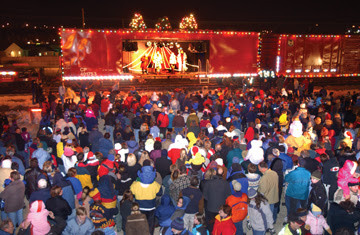 Each year, thousands of people gather along CPR's route to enjoy the arrival of brightly decorated trains and watch entertainers perform a live holiday concert. The Holiday Train also collects food and money to benefit local food banks. Alexandria: 1-2 p.m. - east railroad crossing ny Hubbatrd Feed Mill, 8th Ave. and Nokomis St.
Elbow Lake: 4:30-5:30 p.m., Main St. railroad crossing.